Carduus nutans readily invades disturbed areas and outcompetes native plants. The best form of prevention is maintaining a healthy native ecosystem in recently disturbed sites. It is also invades grazed pastures in USA, New Zealand and Australia, where it reduces the amount of pasture available for livestock. Keeping pastures competitive is the best way to prevent establishment of seedlings. 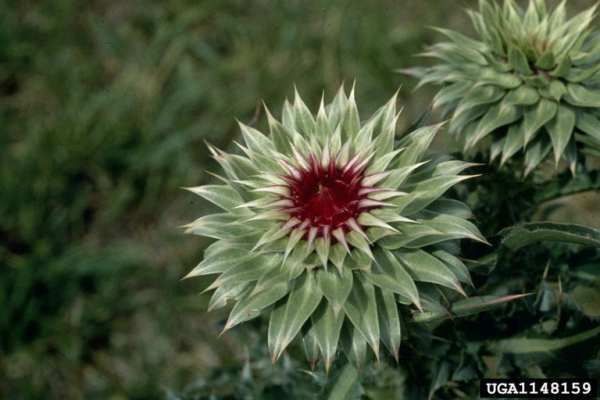 Sharp spines densely cover the stems and leaf margins and give the plant a spiny texture. The stems are multi-branched and erect. The leaves can grow up to 25cm long and 10cm wide towards the base of the plant and get progressively smaller up the stem. Leaves are dark green but get lighter towards the whitish midrib and veins. Once mature, the plant can range from 0.5 to almost 2m in height. Growing at the top of the stem are large flower heads consisting of many smaller, purple florets. These flowers usually bend over and \"nod\" at a 90-degree angle. Carduus nutans grows a rosette that can be a little more than a metre in diameter. 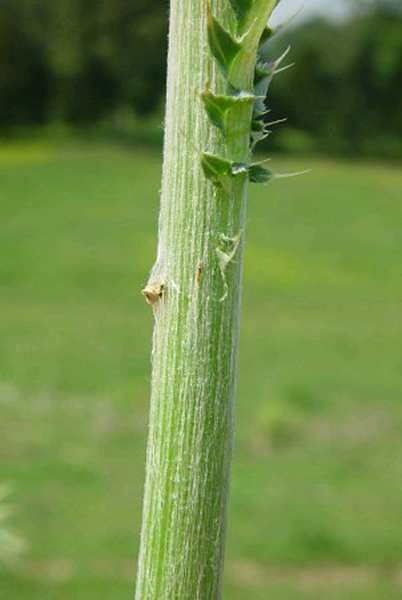 When the plant begins to bolt, it develops multi-branched stems that can reach up to 2 metres. C. nutans usually flowers in the second year after germinating, but it can sometimes flower in the first year in warmer climates. 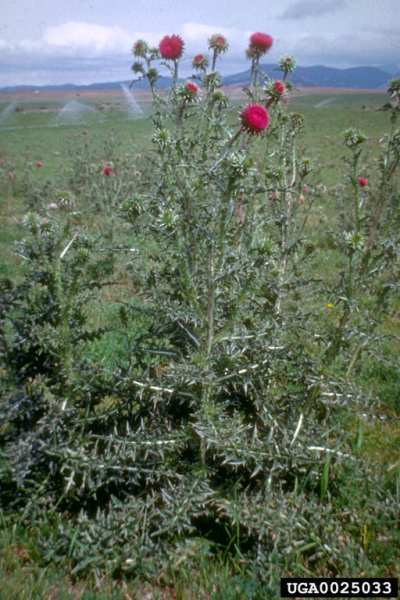 Thistles have been used by humans as both food and medicine. C. nutans has been used in traditional medical practice for stimulating liver function. Areas disturbed by frequent flooding or landslides attract invasion by C. nutans . It does not grow well in excessively wet, dry, or shady conditions. In North America C. nutans is found in meadows, prairies, grassy balds (alpine areas below the timberline that are devoid of trees and dominated by grasses and shrubs), and other open areas. In New Zealand and Australia, it appears in pastures that are not competitive with emerging seedlings in autumn, usually due to over-grazing and dry summer weather. 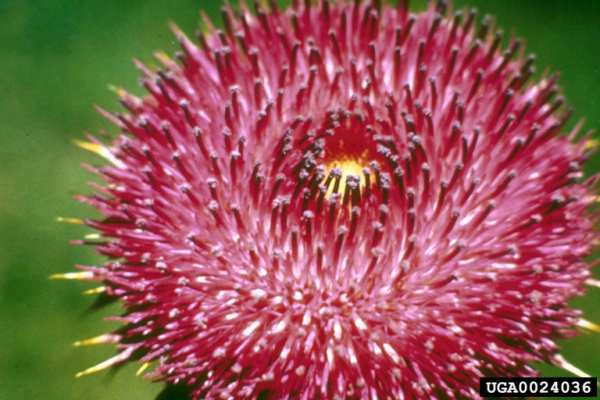 Carduus nutans can self-pollinate but sometimes uses insects for cross-pollination. Flower heads develop at different rates, allowing the plant to produce seeds for extended periods of time. Most seeds do not travel far from the first plant, creating dense stands. Each flower can produce up to 1,200 straw-coloured seeds. Seeds can be dormant in the soil for at least 16 years and still germinate. Carduus nutans is found in neutral to acidic soils. It does not grow well in excessively wet, dry, or shady conditions. It does best under higher soil fertility conditions. 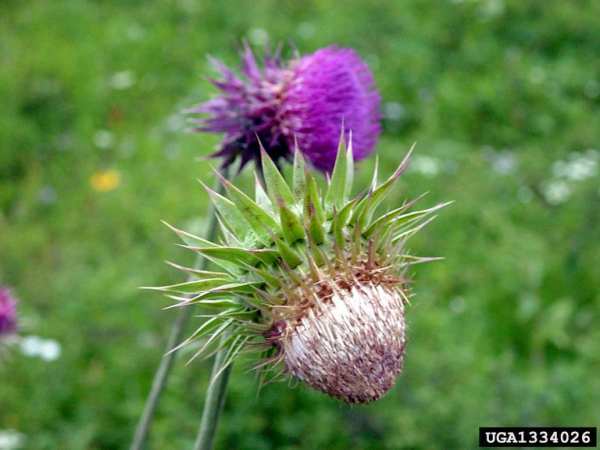 Probably was brought to America as an ornamental.Most dispersal is by contaminants within pasture seed, which is why nodding thistle seed is not allowed within any certified seed lots. 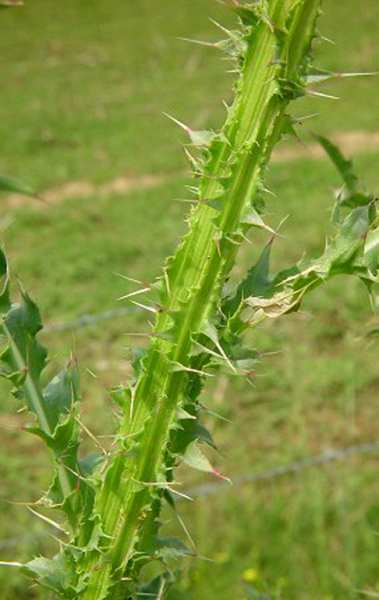 Recommended citation: Global Invasive Species Database (2019) Species profile: Carduus nutans. Downloaded from http://www.iucngisd.org/gisd/species.php?sc=519 on 21-04-2019. Where it is invasive, C. nutans is a problem on farmland because it competes with native forage plants, crops, and hinders the movement of livestock because livestock do not want to walk through it. Native plants are outcompeted by C. nutans because it is a prolific seed producer. It spreads seeds for an extended period of time, dispersing them close to the plant creating dense stands that crowd native plants. It reduces animal production in grazed pastures by reducing the amount of pasture available. The spiny vegetation catches in the wool of sheep, reducing the value of the wool. The presence of the seed in pasture and crop seed generally prevents certification of the seed. Preventative measures: Native species should be replanted after C. nutans has been controlled to ensure that it won't recolonise. Preserving a healthy stand of desirable vegetation will help prevent or at least slow invasion. \r\nPhysical:Hand pulling can be effective for small populations, but plants should be disposed of in a landfill to prevent seed dispersal. Care should be taken to not disturb the soil so that seeds will have a lesser chance of germinating. Mowing can also be used, but timing is imperative; it should be done before the flowers appear and should be done on a regular basis. 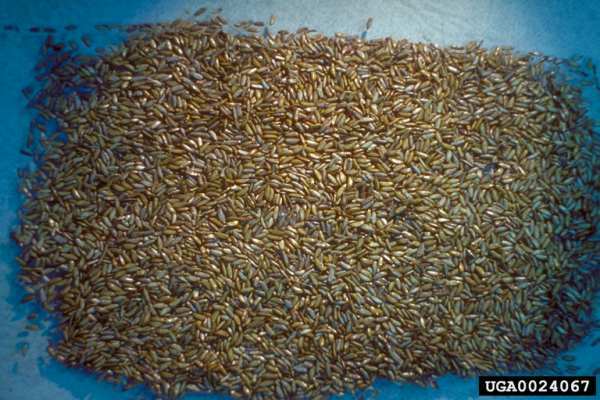 Biological: The gall fly (Urophora solstitialis), the receptacle weevil (Rhinocyllus conicus) and the crown weevil (Trichosirocalus horridus) have been found to be effective in greatly reducing the number of seeds produced. A mathematical model developed, predicts that nodding thistle populations will decline if 65% or more of the seeds are destroyed. Biological control combined with good pasture management has been leading to declined populations in New Zealand. 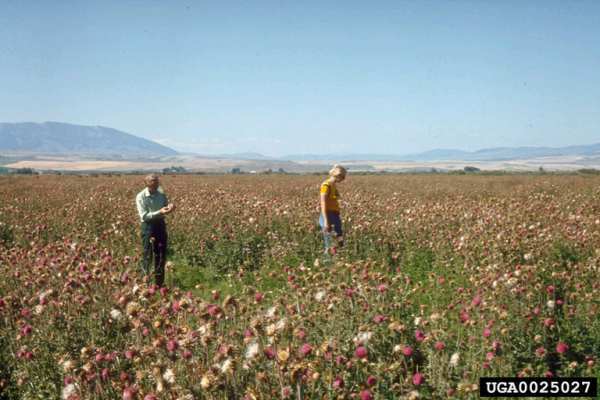 In the United States, weevils (thistlehead-feeding weevil and rosette weevil) introduced from Europe have been found somewhat effective for control, however, the unanticipated effect it has on native populations of thistle in the western U.S. has caused some debate in its continued use (Landcare, NZ). Informations on Carduus nutans has been recorded for the following locations. Click on the name for additional informations. Commonwealth Scientific and Industrial Research Organisation (CSIRO), 2004. Entomology, Weed management Programme- Biological Control. Summary: Bilogical control in Australia. Heidel, B. 1987, The Nature Conservancy Element Stewartship Abstract for Carduus nutans.The Nature Conservancy . Summary: Report on the identification, distribution, history, ecological effects, and detailed report on management. Landcare Research, NZ. biological control Success Stories. Summary: Biological control and containment of Carduus nutans in New Zealand. Remaley, Tom 1999, Musk Thistle Great Smoky Mountains National Park, Gatlinburg, TN. PCA (Plant Conservation Alliance), Alien Plant Working Group. Summary: Report on the description, biology, distribution, ecological effects, and management options. Summary: Report on history, identification, and management. Detailed information of chemical controls. Shea and Kelly, 1998. Estimating Biocontrol Agent Imapct with Matrix Models: Carduus nutans in New Zealand. Ecological Applications, 8(3), 1998, pp. 824�832. Summary: The use of matrix models to assess the impact of biological control and other pest management strategies with a case study of Carduus nutans (nodding thistle) in New Zealand. Taranaki Regional Council. 2003. Thistles. The Pest Plant Management Section. Desrochers AM, Bain JF, Warwick SI, 1988. A biosytematic study of the Carduus nutans complex in Canada. Canadian Journal of Botany, 66:1621-1631. Doing H, Biddiscombe EF, Knedlhans S, 1969. Ecology and distribution of the Carduus nutans group (nodding thistles) in Australia. Vegetatio, 17:313-351. Harrington KC, 1996. 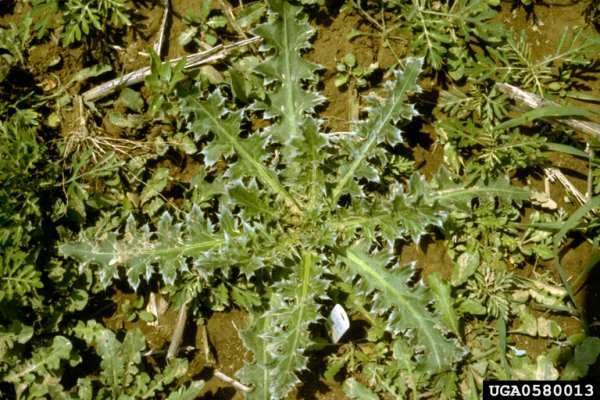 Herbicide management and thistle control - how to avoid resistance. Plant Protection Quarterly, 11:273-275. Moore WB, Doyle CJ, Rahman A, 1989. Economics of controlling Carduus nutans on grazed pasture in New Zealand. Crop Protection, 8:16-24. Popay AI, Medd RW, 1990. The biology of Australian weeds 21. Carduus nutans L. ssp nutans. Plant Protection Quarterly, 5(1):3-13. Research interests: weed science. 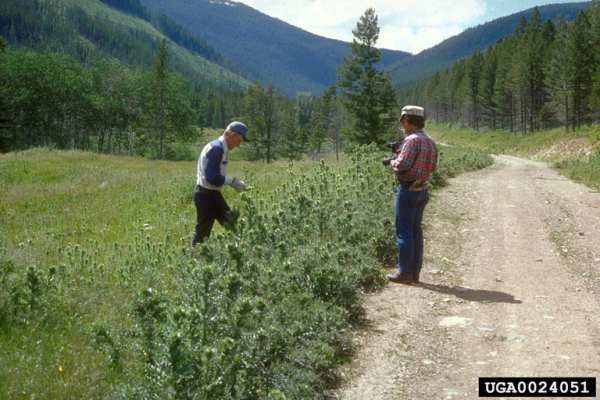 Research projects that have been undertaken have involved a range of topics on weed biology and control in agriculture, horticulture and forestry.